Staying on my instrumental kick from earlier this week, I was pretty happy to see that a part of my mail included the latest album by Munruthel (Vladislav Redkin), the former drummer for the notorious Nokturnal Mortum and the current member of Thunderkraft. What I expected from The Dark Saga was some ambient neofolk, Ukrainian rooted music. And as those nature spirits are my witnesses, I needed that. What I got from The Dark Saga instead was very much a soundtrack-type computer oriented instrumental music. Then, while doing research, I discovered that this was meant this way to suit a computer game, and it made more sense. Too bad, it wasn’t what I was looking for or needing at the moment. If you are not prepared to receive The Dark Saga for what it was meant to be, just like I originally wasn’t, you will find its compositions very literal, every song title conjuring the image exactly the aforementioned title reflects. The theme is introduced and it is pretty much followed plainly, without much deviation. The tracks describe changing computer screens, the game characters or their settings, when they travel through 1,000 year old virgin forest where no beam of light can get through (The Thick Wood), when they come up on some mysterious disappearing tribe’s artifacts (The Old Fort) or necromancer’s castle where rusted doors swing and gravewinds blow (The Graveyard). I can’t possibly say if cello/harp sounds in The Thick Wood or In Those Times when Earth was Breathing are real or synthesized, but overall the album is definitely a computer/synthesizer production, all circling back, perhaps, to its original intent. Some of compositions present an epic feel about them, the druidical The Ancient Ruins or setting out to sea in The Pirates' Bay (saber rattling and coin counting sounds included), but the air on The Dark Saga is very artificial and far from organic. It is all very well produced and polished, but the feeling of reality and connection to the surroundings never comes. 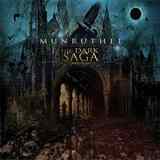 Also, from an outstanding drummer like Munruthel, the percussion on The Dark Saga seems to be underutilized, my favorite tracks from the album all benefiting from the dynamics it brings (the caravan-bazaar flow of ...and the Story has Begun and the tambourine sounds of The Old Fort). While the individual images of The Dark Saga are very easy to grasp, and the song titles hint of them from the word “go”, the album on the whole is a lot more Mussorgsky Pictures at an Exhibition, the series of disconnected pictures all standing on its own rather than being a connected story, every piece here serviceable as an interlude in Munruthel’s other more cohesive albums. It is if this music was ordered from the artist, and then delivered, quality and all, rather than coming from his heart or reflecting his essence. At the same time I would like to recognize the quality effort which went into the making of The Dark Saga and not have it all obscured by what can be labeled as the case of unfair expectations.